A new venture in 2016, we are now growing a beautiful flower garden for pick-your-own flowers and ready-to-go bouquets. We are still having fun trying different varieties of flowers. For now, the garden includes brightly-colored zinnias and sunflowers. The flower garden is an active experimentation zone—we welcome feedback on your favorite varieties! Pick-your-own flowers are priced per stem with prices varying by flower; for example, sunflowers are priced differently than other varieties. 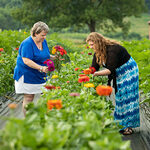 Want to learn more about local flower gardening? Ask a Piedmont Master Gardener!